It's important that he has stepped up and let the soldiers know that he's going to really look at these issues and go after them. There are a lot of things that still haven't been talked about, especially the mental health care needs of our soldiers. For example, at Ward 54 at Walter Reed no one visits those soldiers. No one goes up there and finds out what kind of needs they have. Robinson mentions his work with Mark Benjamin at Salon.com on a story regarding troops who have been given a P-3 profile, or limitating profile, meaning that the soldier can't carry their weapon or their rucksack due to prior injuries, for example. P-3s should not be returned to the combat zone. And yet, troops have been inappropriately deployed -- and now some of them are being sent back, as a recent DoD IG report stated.The Senate and House Armed Services Committees are now looking into the matter. Steve made one important point after another. This one especially needs to be shouted out from every rooftop across the country, given in reply to Judy Woodruff's question, "So when the president says he acknowledges there are failures, he apologizes -- look at the overall picture -- commissions have been appointed by the president, by the Department of Defense, at the Veterans Affairs. Is this administration responding as it should be to these problems?" "Well, from this point forward there is a response [via the investigations and congressional committees] and we're looking to see the results of the commissions. But one question I want to raise right now is: What about all of the people that fell through the cracks that have now been kicked out of the military inappropriately, have lost their VA benefits forever because they weren't screened for mental health or they didn't identify their traumatic brain injury? If we're going to move forward from this point forward, and draw a line in the sand and move foward, that's great. But let's make sure we take care of those people that have honorably served and didn't get the help that they need. Let's go back in time and correct those problems, too." Marine Corps News reports on 1,800 Individual Ready Reserve (IRR) Marines who are receiving notice this week of their forced return to active duty (second story in the clip below). Required to check in between April 10-30, it is the largest such call-up of IRR troops since Operation Iraqi Freedom began. Such orders add a unique stress to the life of a veteran whose contract was thought to have been fulfilled. And they may increase the likelihood of having to deal with PTSD down the road. Most of the 1,800 Individual Ready Reservists the Corps involuntarily recalled this week will be sent to Iraq to fill specialty jobs the service is having trouble filling, according to a mobilization official. Letters were mailed Monday to those IRR Marines, notifying them of an April muster in Kansas City, Lt. Col. Jeff Riehl, a mobilization officer with Marine Corps Manpower and Reserve Affairs, said Monday at a press briefing. Those accepted for active duty will be issued orders to report for an Iraq deployment with I Marine Expeditionary Force in October, he said. “Unit deployment dates will be in early 2008,” he said. The Corps is authorized to involuntarily activate 2,500 IRR leathernecks at one time. Mobilization officials called up 150 IRR Marines in December, of which only 69 were fit for active duty. This second round of involuntary call-ups will target 1,800, with the aim of filling about 1,200 active-duty slots. Specifically, the Corps wants 361 aviation mechanics, 225 for logistics support, 223 for combat arms, 178 for motor transport, 97 for communication, 95 for intelligence and 21 for military police, Riehl said. This week’s call-up is heavy on junior leathernecks and midgrade officers, including more than 1,000 sergeants and more than 100 captains, Riehl said. Hundreds of thousands of National Guard and Reserve members previously mobilized for tours in Iraq and Afghanistan are exposed anew to involuntary call-up under a policy change unveiled with President Bush's plan to "surge" forces into Baghdad. Defense Secretary Robert Gates said he has rescinded a rule, set in 2002, that barred involuntary mobilization of reserve personnel beyond a "cumulative" 24-month ceiling for a wartime emergency. The now shelved 24-month "cumulative" rule had been in effect five years, long enough that some Guard and Reserve members, and their families, might have believed it protected against a second call-up. But Brig. Gen. James W. Nuttall, deputy director of the Army National Guard, said a majority of Guard soldiers will not be surprised by the policy change, given the nature of the wars they've experienced firsthand. The Individual Ready Reserve (abbreviated "IRR" and sometimes referred to as the Inactive Ready Reserve) is a category of reserve component of the United States military, composed of former active duty or reserve military personnel who are no longer serving but still have time remaining on their initial eight-year military service obligation, or their subsequent reserve obligation. As of 2004, the IRR includes approximately 118,000 soldiers, sailors, airmen, and Marines. On 29 July, 2004, 5,600 members of the IRR, mainly with specialties as military police or civil affairs officers, were called back to active duty to support U.S. forces in Iraq. This activation was the first time that the IRR had been called upon since the 1991 Gulf War, when approximately 20,000 IRR troops were called up in support of Operation Desert Storm. *About 550 of those called have failed to report for duty, some claiming exemptions, others ignoring their orders. Normal obligations are for four years of active duty and four years on inactive duty. Gary Solis, retired lieutenant colonel for the Marine Corps, spoke of the unique stressors of such orders on NPR's Talk of the Nation. Over 350,000 US soldiers were in the Persian Gulf Region during Operation Desert Shield and Storm (ODS/S). This deployment required rapid short-notice deployment of Active Army Units and Army Reserve and National Guard Unit Soldiers. The Individual Ready Reserve soldier was the focus of the present study. Given the fact that the reserve soldiers differ from active duty soldiers on a number of dimensions, the unique deployment and activation experiences of IRR soldiers offers a number of valuable lessons regarding the effects of stressors, stress buffers, mediators, and family and unit support. Of the findings, two were most significant: (1) Because Individual Ready Reservists were not a part of any particular unit, they and their families felt isolated in many respects and (2) soldiers and their families were still experiencing impact from their deployments several years after Operation Desert Shield and Storm. While these stressors were exhibited in a war of such a short duration, today's troops have the additional strain of long-term plans being placed on hold as our wars drag on. Educational goals have to be halted; business entrepreneurs have to put dreams on hold, or those already running businesses may suffer financially or even go under with these types of IRR recalls. This is a unique financial burden which does not have the same impact on active forces. On Tuesday, it will have been four years since the United States invaded Iraq, and Marine Lance Cpl. Nicholas Kirsch has been deployed there three times. The government now hopes he'll sign on for what could turn into an almost-unheard-of fourth tour in Iraq. "I don't think I'm going to go," Kirsch said. "I'm going to school now." Kirsch, 23, who is single and a student at Utah Valley State College, is taking classes in art and writing. But he recently received a letter from Marine Lt. Gen. James T. Conway, encouraging him to re-enlist. Kirsch finished his four-year enlistment last year. But for another four years, he's considered a member of the Marine version of Individual Ready Reserve, a component of the military that the government can use to recall service members back into active duty. Even if he doesn't re-enlist, he could end up going anyway — involuntarily. During his first two deployments to Baghdad for the 2003 invasion and then Fallujah near the end of 2004, Kirsch shot his weapon at Iraqis who were trying to kill him. To this day, he is still sensitive to loud noises and has trouble being in crowds, instinctively checking who is around him as he walks the halls of UVSC. "I don't want to go to Iraq again," he said in an interview. When the Marine who fought in the bloody retaking of Fallujah in 2004 received the letter, he read it over carefully a number of times. It attempted to appeal to his loyalty to mission and man, saying, "You are elite among the nation's warriors. The job you started is not yet finished." It is not known if Kirsch is among the 1,800 who have received their orders back to active duty. Every so often, government does exactly the right thing. The decision to make former Texas Congressman Pete Geren the acting secretary of the Army is just such an example. Geren, the under secretary of the Army since February 2006, was elevated to acting Army secretary on March 9 following the resignation of Francis J. Harvey — who left in the wake of the Walter Reed Army Medical Center scandal. The Bush administration has a sad history of putting unqualified political cronies in key positions. Geren may be a Texas friend of the president, but he is also eminently qualified to be secretary of the Army at this particular point in history. In fact, the White House may not be entirely happy with Pete Geren when the dust settles. You see, Geren will not lie for this White House and he will not shade the truth either. He is a straight shooter who has the respect of both Democrats and Republicans in Congress. When called to testify on the Hill, he will answer questions truthfully and, if doesn’t know an answer, he will ask for the time necessary to provide a complete response. And Congress will get an answer. Jumping right in to things, Geren commented earlier in the week on the Pat Tillman scandal, saying that it "brought discredit on the Army." He also toured Walter Reed Army Medical Center, giving a candid interview to the Pittsburgh Tribune-Review along the way. And in his first address as secretary of the Army, he spoke to the staff at Walter Reed. Tricky tasks, every one. WASHINGTON - In his first public address as acting secretary of the Army, Pete Geren today addressed personnel of the North Atlantic Regional Medical Command and Walter Reed Army Medical Center at WRAMC. He spoke about the many changes affecting today's Army, including "the sweeping transformation" that includes realignment and closure of bases and the "rebalancing of the force." What leaders and staff members of the Army's medical community likely most wanted to hear came at the end of Geren's 20-minute speech, when he talked about recent events that have since plagued WRAMC, resulting in the firing of the hospital's commander and the dismissal of the secretary of the Army, among others. Following his rundown of changes affecting the 1.3-million "Army-Strong" family, which includes active-duty, National Guard and Reserve Soldiers, and civilian employees, Geren said, "Our Army will meet these challenges." At the top of the list of priorities, he said, would be to provide the best possible care to military personnel who "have fought the battle," because they deserve nothing less. "The American people expect us to fulfill our obligation to those who serve, and our Army leadership is acting decisively to correct [recent shortcomings in medical care]," he added. He made a point, however, to commend the workers at WRAMC who carry on a 231-year tradition of service and "have provided some of the nation's greatest advances in medicine. "We pledge that we will never leave a fallen comrade. That means on the battlefield and in the hospital," he said. "In a time when much of medicine has become business, you care about people." Geren based that assessment on the well-documented cases of stellar care already provided by WRAMC professionals to some of the nation's more than 26,000 wounded Operation Iraqi Freedom and Operation Enduring Freedom veterans. Researchers found that almost 80 percent of the depressed people they interviewed showed symptoms of post-traumatic stress even if they could not name a single trauma that could have caused them. "If you can identify a nasty event which occurred before these symptoms emerged, you can call it post-traumatic stress disorder," said Dr. J. Alexander Bodkin , lead author of the study in today's Journal of Anxiety Disorders. "I'm not saying there is no such thing as a mood or anxiety disorder caused by traumatic events, but the symptoms [used to classify the illness] are really grossly inadequate." Bodkin said it's crucial to get the diagnosis right. Though people diagnosed with post-traumatic stress commonly are also treated for depression or anxiety, he said some treatments for post-traumatic stress, such as focusing on "facing" the trauma, could be counterproductive. "It might be worse than a waste of time. Maybe you don't need to work through what is bothering you. Maybe you need to get over what is bothering you," said Bodkin. The study joins a growing body of research that questions whether post-traumatic stress disorder is a distinct mental illness, at least as it is currently defined. Unlike other mental illnesses, the diagnosis of post-traumatic stress disorder begins not with the patient's symptoms, but with identifying a major trauma such as witnessing a murder or fighting in a war. Critics say that can lead therapists to falsely conclude that the symptoms were caused by the trauma. It could be that the trauma worsened an underlying condition such as depression or anxiety. Yesterday, psychiatric researchers who wrote the post-traumatic stress disorder definition agreed that the definition needs to be tightened. Psychologist David Barlow of Boston University said the official definition, which he helped develop in 1994, has become outdated as advances in brain science suggest that post-traumatic stress is more closely related to other conditions than researchers recognized at the time. "We might need to step back a level and begin looking at what these disorders have in common," said Barlow, then cochairman of the committee that wrote the post-traumatic stress disorder section for the psychiatrists' bible, the Diagnostic and Statistical Manual of Mental Disorders, or DSM. However, Dr. Michael First , editor of the DSM, said he believes post-traumatic stress disorder is a separate disorder. "My concern is that it's overused," said First, of Columbia University. "It started out as combat neuroses for very severely traumatized soldiers, but now it's all over the place." The researchers at McLean Hospital interviewed 103 depression patients using the same survey that a counselor would to diagnose post-traumatic stress. If patients hadn't suffered a serious loss, they were urged to discuss even a minor trauma that caused them recurrent distress. Researchers found that 79 percent had PTSD symptoms, including 28 patients who could not come up with one traumatic memory. Bodkin said the results show that the definition of post-traumatic stress disorder is unreliable. "People have just been averting their eyes since 1980 from some pretty glaring scientific problems," he said. The issue of data secuity at the VA has a direct bearing on the ability of troops to work past the stigma of coming forward for mental health care. If a vet worries about the possibility of his confidential files being breached, they may not be nearly as open to seeking the help they need for worry that their privacy may be invaded. And so, the latest news out of the VA is not heartening. In recent weeks, VA officials have faced a fresh round of bipartisan criticism over data security, with auditors telling Congress that gaping holes persist and that most VA data remains unencrypted. At a hearing last month, Maureen Regan, counselor to the VA inspector general, said the department still hasn't fully implemented any of its recommendations from reports dating back to 2001. The department also hasn't adopted five key recommendations issued shortly after the massive data breach last May involving veterans. —Spent more than $35 million for equipment and supplies under the contract that it cannot account for. —Hastily increased the scope of the contract several times, bringing the total value of the contract from $102.8 million to $250 million with little thought or oversight. "This made the contract an open checkbook ... with little assurance of price reasonableness and no planned funding." —Did not ensure that the joint venture, VAST, met requirements to qualify as a small business. —Made overpayments on the contract as high as $8.5 million. —Did not conduct required background investigations on the contract employees. Please view and share my first vodcast describing my journey of reporting on combat PTSD in our returning troops -- the question I'm asked most frequently -- and inviting others to join with us. Please share the link with your contacts, embed it in comments in your favorite online communities, and give it a recommend and comment if you so choose. Senators Barack Obama [D-IL] and Claire McCaskill [D-MO] recently introduced the Dignity for Wounded Warriors Act (S. 713). While it's been read in committee a couple of times, it awaits a full consideration. A portion of it has taken on new life, however, and could use our support. [UPDATE Mar 29, 2007]: While the Wounded Warriors Act passed unanimously in the House yesterday, the Senate amendment based on the Senate version of the same bill was struck down. The two Democrats from neighboring states introduced an amendment Tuesday that would add more mental health and crisis counselors for troops and their families. It would also improve mental health services for women in the military who have been victims of post-traumatic stress disorder or sexual assault and abuse. The $103 million measure would become part of the larger $121 billion Iraq supplement bill being debated in the Senate. It would also hire more hospital caseworkers to help troops receive faster treatment and benefits. Please call or write your Senators and ask them to support this amendment. Veterans for America has made it easy to do with their online action form. Veterans for America is doing everything we can to make sure this amendment gets passed – but, we need your help. Too many of our troops are returning to a system that completely ignores their most urgent service-related health and readjustment needs. The face of today’s military is drastically different from any military we have ever sent to war, and our current system does not address their specific needs. It took ten years after the end of the Vietnam War to understand the specific needs of my generation. We cannot wait that long this time around. If we do, we will fail thousands upon thousands of service members. We must stop throwing money at a broken system that does not have the capacity to address the most urgent unmet needs of today’s service members and veterans. Please urge your senators to immediately co-sponsor this amendment. Also, please pass this email along to friends and family. Our work on behalf of our troops is dependent upon this study. Please see VFA's action page to send your support. Any Seamless transition program must also include comprehensive screening for Traumatic Brain Injury (TBI), Post Traumatic Stress Disorder (PTSD) and vision loss by both the DOD and the USDVA Health Care systems. I know that efforts are underway to strengthen these assessments by both the DOD and the USDVA. However, there is no standard procedure in place to insure that all war wounded are screened nation-wide. Currently, there is an issue with TBI screenings. Some service members who are not screened for TBI, are being identified as suffering only from PTSD. However, it is possible to have both PTSD and TBI or either condition alone. My concern is that service members with TBI are not diagnosed and then return to civilian life without this medical condition noted on their records. The symptoms of TBI can result in inability to work or even aggression that results in homelessness and entry into the criminal justice system. At that time, these veterans are then often diagnosed as having PTSD and treated for PTSD even though the main injury is TBI. What is significant about this situation is that TBI and PTSD have many treatment methods that are the exact opposites. One additional screening criteria that is critical is testing for vision loss. At the Hines USDVA Hospital, all poly-trauma patients are routinely screened for vision loss as soon as they enter the facility. The result of these screenings is that 60% of the poly-trauma patients at Hines have been found to have some form of functional vision loss. Vision loss, an acute injury on its own terms, can also negatively affect how patients perform on tests for TBI, which are heavily reliant on vision. Hines is the only USDVA facility in the nation that conducts routine screening of patients in its poly-trauma centers. This is because it is the initiative of the excellent Blind Rehabilitation program at Hines. I would like to close by saying that I have had a surprisingly positive transition to the VA system. I also understand that this may not be the same across the board for all returning service members. There are problems that can be resolved such as the establishment of standard screening criteria for major injuries such as TBI, PTSD and vision loss. I would also strongly urge this committee to consider eliminating the two year window for free VA care for OIF/OEF veterans. This is a new time limit that will limit veterans’ ability to access care for injuries such as PTSD, which may not become evident until over two years after their service. We have more work ahead of us, but much of it can be resolved through information sharing, use of patient advocates, and a willingness to access private healthcare specialists. Duckworth arrived at the shelter [Midwest Shelter for Homeless Veterans in Wheaton] with a new political war to wage: improved health care for veterans. Having lost her congressional bid to Republican Peter Roskam of Wheaton last year, Duckworth is now the director of the Illinois Department of Veterans Affairs. The shelter staff believes her firsthand knowledge of the physical and mental wounds of war will bring needed change. Duckworth delivered the promise of a $128,000 check for the shelter Wednesday. It will be the first facility in the state to reap the benefits of a state scratch-off lottery ticket game earmarked for veterans. She had already visited the facility last summer. At the time, she was in a wheelchair, and the facility hadn’t yet opened. Wednesday, she navigated steps with the aid of a new, $100,000 prosthetic right leg. The shelter has been open for two months and is already at capacity with five residents and a waiting list. Shelter officials want to expand to 20 residents as soon as next year. To do that, they’ll need more money and an easier process to get veterans enrolled in entitled benefits. Ideally, the shelter would like to become a line item in the state budget. Duckworth said such a move must come from the state Legislature. On her end, she’s in the process of hiring a grant writer for the veterans affairs department, a position that hasn’t existed. She believes it will bring more federal dollars to Illinois veterans and facilities like the one in Wheaton. She’s also developing a single form to guide Illinois veterans through all the programs they may qualify for. She’d also like to see a relaxing of medical privacy laws so the state can obtain names of veterans as they return home and enroll them in benefit programs faster. In addition to medical treatment, Seamless Transition is also the passing from one administrative program to another. The Seamless Transition initiative needs to be expanded to each state’s VA, and more importantly, local counties and municipalities. The current model for Seamless Transition focuses on transition from the DOD to the USDVA entities within the state. It is also important to involve each state’s VA agency as there are many state programs that are unique to the state. For example, in Illinois we provide Veterans’ Care, a health insurance plan for veterans. We also provide additional funds for accessibility modifications to disabled veterans’ homes. New benefits are added at the state level more quickly than can be tracked by the USDVA. For example, as of January this year, Illinois gives up to a $600 rebate on employer’s state taxes for each Persian Gulf War, OIF or OEF veteran that they hire. Tammy Duckworth says that while the American public has been supportive of the troops the government has failed them by not planning for their long-term care. She says, not only is Walter Reed an example of that, but possibly Brooks and Bethesda medical centers. She also agrees with setting deadlines to draw troops out of Iraq. Now, one of the latest people to head to the Middle East is her husband. "I get to see what it's like to be the person who gets left at home, and sometimes, I think that's almost more difficult," said Duckworth. Tammy Duckworth is preparing herself for a day next month when her husband of 14 years, Brian Bowlsby, will be deployed to Iraq for at least a year. He will help to run convoys on the roads, a dangerous assignment that makes her anxious. Duckworth was in Iraq three years ago when insurgents shot down the helicopter she was piloting and she lost both legs. But, she says that while her husband is away, there is a lot on her plate to keep her busy. "I absolutely want to start a pilot program for post-traumatic stress disorder here in Illinois. We would be the first state in the country to do it," Duckworth said. Duckworth is director of the Illinois Department of Veteran's Affairs. Her priority is to make comprehensive, affordable health care available to vets. But, she is also taking on the federal government, speaking out against the Iraq war and criticizing President Bush for what she says is the lack of a plan to take care of the increasing number of injured veterans. She says that is why solders face dilapidated and unsanitary conditions at Walter Reed Hospital. "But when I was there, in the second year of the war, there were only a couple hundred of us who were living in an outpatient basis. I think there are now 700 outpatients and they've had to reopen buildings that have been closed down," said Duckworth. Today, a great personal honor arrives on page three of the Northern Star, Northern Illinois University's newspaper of record. I arrived Monday on campus to find that that managing editor, Michael Swiontek, wanted an interview (thx, Prof. Akst). The result? This big chunk of real estate today. Contributing comments were Markos Moulitsas Zúniga, editor of Daily Kos (and NIU alumni inducted into the Northern Star Hall of Fame just this month), the online community (in tandem with ePluribus Media) that gave me a forum to develop and share my PTSD work, and Jim Starowicz, an active Vietnam veteran whose tireless work would exhaust lesser souls. Rounding it all off, my thanks to Northern Star photographer Mike Greene, too. Reprinted in full for media kit [pdf]. Junior journalism major Ilona Meagher recently finished writing a book titled "Moving a Nation to Care: Post-Traumatic Stress Disorder and America's Returning Troops," which will hit bookshelves in May. At surface level, Ilona Meagher looks like an average, attentive, 41-year-old non-traditional student. Meagher, a junior journalism major, possesses an overwhelming passion for shedding public spotlight on the post-traumatic stress disorder engulfing the souls of so many Iraq war veterans. Tragedy changed Meagher's plans. 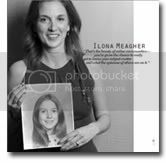 Becoming a journalist, editor of an online journal and author of a book were not Meagher's original ambition in life - her life soared above the clouds, with a 15-year career as a flight attendant with American Airlines. Her life, like those of many others, was firmly in place before the events of 9/11 shook the foundation of her existence. Post-9/11 cutbacks put Meagher in position to take an early-out package. She created a freelance business specializing in Web design and copy editing. Then, one day, an article she read from across the country changed her life. An article in Seattle Weekly shocked Meagher, prompting her to ponder several questions. Meagher, whose sister took her own life in 2000, learned that several Iraq war veterans committed suicide after suffering from PTSD. A self-proclaimed natural researcher, Meagher's quest to get answers drove her deeper into the questions. Meagher discovered her passion for writing by her desire to advocate awareness of post-war PTSD. A citizen journalism cooperative, ePluribus Media, discovered her data online, and helped by compiling the database, fact-checking and editing. Meagher feels fortunate she has received so much help informing the masses on the issue. The success of her online journal, PTSD Combat: Winning the War Within, has led to other ventures. "All these incredible opportunities came to me," she said. Tragedy also has changed Meagher's aspirations. One year ago, a publisher from New York contacted her, expressing interest in a book on post-war PTSD written by Meagher. The network of experts and journalists she developed a rapport with made the seemingly overwhelming task of writing a book without any formal training manageable, she said. Meagher's book, "Moving the Nation to Care," will be released by Ig Publishing on May 1. Recently, Meagher became a contributor to the Clark Community Network's Troops and Vets series, the blog of former presidential candidate Gen. Wesley Clark. Though Meagher has no military experience herself, her father fought for both the Hungarian and U.S. military, giving her the foundation to pursue military topics, she said. She credits her husband, who still serves as a pilot with American Airlines, with giving her the ability to work on her blog unpaid. A nonprofit company has contacted Meagher about potentially presenting her a grant for her blog work and her contribution to the PTSD database. "As difficult as it has been to juggle everything, I learn something with every class," she said. "No matter what the topic is, the more informed you are about a variety of issues, the more you are going to be able to understand a lot of concepts that are bigger than post-traumatic stress." Meagher spends an average of three hours per day corresponding through e-mail with veterans and their families, editors, citizen journalists and other bloggers. Even with the strong feelings and opinions presented on both sides of the Iraq war debate, Meagher has not chosen a public stance. "It doesn't matter what party affiliation you have, you can get PTSD," she said. "I have met so many people that are working hard on this issue - citizens, activists and veterans. While the data is depressing and hard, I have met so many incredible people through email and meetings - they inspired me." Anyone who says that good journalism doesn't change lives would find themselves at odds with my experience. Please read the rest; the PDF version contains a sidebar of quotes from Markos and Jim. 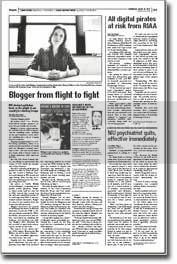 [UPDATE Aug 31 2007]: Previous links are now broken, so I've excerpted in full for archiving and saved a PDF of the cached page. I'm penciled-in to appear at firedoglake's Sunday Book Salon, hosted by the gracious Taylor Marsh, on the afternoon of May 6 (5pm ET/2pm PT). Paul Rieckhoff of Iraq and Afghanistan Veterans of America (IAVA) has offered to have his organization officially sponsor my New York City-Greenwich Village Barnes & Noble appearance. He says he'll try to make the event himself (crossing fingers), which takes place on May 18. Air America's smashing Sam Seder has me slated for an on-air interview sometime in May. No date set yet, but will pass it along as soon as I know it myself. Although not officially announced as of yet, I've been invited to be a member of August's YearlyKos Convention veterans' panel -- a great opportunity. Last year, C-Span covered many of the panels, so maybe we'll get lucky and have a chance to get our message out to a wider audience. When you start talking about PTSD of returning soldiers, I want to point out Ilona Meagher’s book Moving A Nation to Care: Post-Traumatic Stress Disorder and America's Returning Troops. I’ve met Ilona at a couple conferences. She is a great writer and I’ve managed to get a review copy of her book. I highly recommend it to anyone concerned with the fate of our servicemen and women. We both attended the National Conference on Media Reform held in Memphis in January (and the preceeding Journalism That Matters sessions). 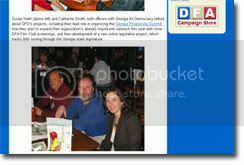 I was his guest at a Democracy for America dinner meet-up one drizzly evening, shared on the DFA website. View more pics of both the dinner as well as the other two events we'd attended in my Flicker album. UnConventional, YearlyKos: Citizens, Focus and Action, an in-depth eBook covering the first YearlyKos convention is available NOW. A team of four brilliant photographers led by Mona Brooks along with an editorial staff led by Hunter of Daily Kos fame, documented every aspect of the convention, from caucuses to keynote speeches, from volunteers to political heavy-hitters, so many Kos bloggers, and more. The Army's new acting surgeon general said Tuesday she is concerned about long-term morale because the military lacks money to hire enough nurses and mental health specialists to treat thousands of troops coming home from Iraq and Afghanistan. "When the original plans were made, we did not take into consideration we could be in a long war," said Maj. Gen. Gale Pollock. She became surgeon general earlier this month after Kevin Kiley was forced to resign in a scandal over poor treatment of war-wounded at Walter Reed Army Medical Center. "We have not been able to do the hiring," Pollock told a House Armed Services subcommittee. She testified at the first of two congressional hearings Tuesday on veterans care during which lawmakers expressed impatience with the Bush administration's efforts. They said years of communication gaps between the Defense and Veterans Affairs departments have yet to be fixed. Pollack is not the first military official to sound such an alarm. In January, Navy Cmdr. Mark Russell warned that the military lacks enough mental health care providers to treat combat forces serving in Iraq and Afghanistan. He's been speaking out for three years of the coming mental healthcare crunch. Low morale rate -- called 'compassion fatigue' or 'provider fatigue' by the Army -- isn't a problem we'll have to tackle in the future. It already exists today. In a recent internal military survey, "33 percent of behavioral-health personnel (counselors and psychiatrists) and 45 percent of primary-care specialists (doctors and nurses) complained of high or very high burnout." •The Navy has 72% of the psychologists and 62% of the psychiatrists it needs, although trainees will raise staffing levels to 85% for psychologists and 91% for psychiatrists. •Army staffing levels for uniformed psychiatrists and psychologist are at 80%-85%, but the Army has contracted with large numbers of civilian mental health officials to help in assisting soldiers. Lt. Cmdr. Brandt E. Rice, a family medicine practitioner at the naval hospital, testified that doctors are saddled with too many administrative duties, lack enough time to devote to patients and face bureaucratic hassles. "My vocalness about this need has been met by some degree of resistance and also retaliation," Rice said. Ursula Henry, a former Navy worker at the hospital, said some staff members have been "so frustrated with the whole scenario that they left to go across the street" to work at the National Institutes of Health. Of course, compassion fatigue is hardly limited to military mental health providers; caregivers in the wake of Hurricane Katrina were also found to suffer from it. Even the general public was said to have suffered from compassion fatigue following successive natural disasters: the Asian tsunami, the Kashmir earthquake. "Compassion fatigue" is a fairly new term that describes certain emotions and behavior that people, often clinicians such as psychologists and therapists, sometimes experience as the result of hearing about and knowing about the traumatic experiences of others. It is part of the "secondary post-traumatic stress" family of responses that people may have when they help trauma victims. The symptoms, which are similar to the symptoms of post-traumatic stress, can interfere -- sometimes profoundly -- with a person's personal and work life. Compassion fatigue has also been described as "vicarious traumatization." Signs of possible compassion fatigue include nervousness and anxiety, irritability and anger, moodswings, flashbacks, difficulty concentrating, lowered self-esteem, feeling less trusting of others and the world, withdrawing, changes in appetite or sleep habits, physical changes and/or depression. Get support from people you love and trust. Participate in debriefing sessions specifically for clinicians. Set more boundaries during this stressful time. Avoid using alcohol or nonprescription drugs to handle your emotions or to relax. Crisis management may not be your primary area of expertise. Try to make your office area as comfortable and soothing as possible. Know and honor your own limitations. Remember to focus on the powerful impact you're having on the people you're helping. Seek professional help if you are not yourself. Read the full description of above tips, available either online or via downloadable PDF. You can find more tips in the Army's Battlemind brochure, 12 Tough Facts for Army Helping Professionals [downloadable PDF]. And to gauge your own stress level, the Compassion Satisfaction and Fatigue (CSF) Test is one handy tool you can use. Can any of us live without our computers these days? They have become a quality-of-life issue for many, most especially those who are mobility-impaired. Wounded troops receiving care at Walter Reed Army Medical Center are no different. They'd like to be able to check their email, surf the web to listen to music or watch the latest videos uploaded on YouTube. More importantly, computers provide an alternate way to communicate for those who may be disabled due to their injuries. In addition, a large chunk of resources aimed at helping vets and their families navigate their way through the military medical system is found online, so access is vital. Unfortunately, there aren't enough computers available at Walter Reed to meet the demand. Enter Laura Brown, a military mom who has sprung into action to fill the need, "one laptop at a time." The 50-year-old from Cody, Wyo., was chatting on the Internet with the mother of a wounded soldier two years ago when the mother mentioned she had to print out her son's e-mails and take them to him at Walter Reed because there weren't enough laptop computers to go around. Brown, whose own son had recently returned safely from the war, thought the solution to that problem seemed incredibly easy. "It just kind of hit me," she said. "If one person needed one, then there's others. ... I mean, my son had e-mail in Iraq. I was really stunned." So Brown formed a group, Laptops for the Wounded, to raise money for the cause. Since its fundraising effort began in November 2005, Brown's organization has donated 27 computers to military hospitals around the country — 24 of them to Walter Reed. We are non-profit organization with a goal to provide laptop computers WITH WEBCAMS for the wounded military personnel in hospitals, so they can have access to family and friends when they cannot be there with them. Unlike the other organizations that do similar work, our laptops will stay at the participating hospitals so they can continue to be used by the next wounded soldiers in those hospitals. Learn more by visiting the Laptops for the Wounded website, and consider joining together with Ms. Brown in this worthy effort. The power of one, indeed. The general said people under his command are getting the message, and Fort Carson is doing more than ever to treat mentally ill soldiers and return them to the battlefield. The Army gets a big assist from civilian care providers in Colorado Springs. Critics, including mental health activist and ex-soldier Andrew Pogany, say the Army is still letting scores of soldiers slip through cracks. But even Pogany admits the Army is improving its level of care. Since 2003, every soldier returning from Iraq or Afghanistan to Fort Carson has been screened for mental illness symptoms. Unit chaplains are also asked to identify soldiers who might have mental health difficulties. Crnkovic said the cases at Cedar Springs have become “more complex” because of multiple traumatic wartime experiences. “That seems to create layers and layers of the stress, so there’s more to work through,” she said. Most soldiers at St. Francis, Purcell said, are referred there from Fort Carson and voluntarily check themselves in. Some soldiers, though, are there on an involuntary 72-hour hold. They’ve been deemed a danger to themselves or others, perhaps because of psychosis or severe depression. Over three days, they are evaluated and could be court-ordered to stay longer. Crnkovic and Purcell also are seeing substance abuse related to PTSD. “Unfortunately, that is not rare. We do see many people who make an attempt to deal with their symptoms by using, for example, alcohol or other substances,” Purcell said. Read the rest, then head over to take a look at two more in their series [ 1 | 2 ] to hear how troops are faring. Thousands of Fort Carson soldiers have been to Iraq twice since the war began in 2003, and hundreds have served there three times or more. The post’s 3,600-soldier 3rd Heavy Brigade Combat Team will head to Iraq in September for its third yearlong tour in five years. Passing by a margin of 218-212, HR 1591 (also known as the U.S. Troop Readiness, Veterans' Health, and Iraq Accountability Act of 2007) includes a measure challenging the president and requiring the eventual withdrawal of forces from Iraq by 2008. The bill, however, also adds $3.5 billion more (increasing the total to $6.6 billion) for healthcare funding for veterans and active forces than was sought from Congress in the president's 2008 budget. After Congressman Bob Filner read the Washington Post's series on the scandalous treatment of injured soldiers at the Walter Reed Army Medical Center, he called Speaker of the House Nancy Pelosi and delivered a simple message: Their party had to fund the wounded warriors as well as the war--or instead of it. For years Filner, a liberal Democrat who represents the military stronghold of San Diego, had been warning that the country's military and veterans hospitals were strained to the breaking point. In the wake of Walter Reed, the public and the party were finally listening. House Democrats added $3.5 billion to an Iraq spending bill to treat brain injuries and posttraumatic stress disorder (PTSD) for returning soldiers and upgrade the country's 1,400 deteriorating veterans hospitals. The increase approved by the House Budget Committee early Thursday on a 22-17 vote would add $3.5 billion to the Bush administration’s fiscal 2008 spending request for the Department of Veterans Affairs. Rep. Chet Edwards, D-Texas, who helped push the budget committee for the increase, said the $6.6 billion jump would be the biggest one-year increase in VA’s 77-year history. Edwards said the extra money would pay for researching and treating post-traumatic stress disorder and traumatic brain injuries, the effort to reduce the six-month wait for processing claims, cutting the $4.9 billion backlog of maintenance and repair at hospitals and clinics, and treating what he estimated are 34,000 Iraq and Afghanistan combat veterans with 'serious mental illness.' “Our veterans have stood up for us. Now it is time for us to stand up for them,” he said. While the president aims to veto any legislation that might include a withdrawal of troops provision, hopefully we can save this important funding from the chopping block. After reading the NYST article I was moved to offer my services to those in need in the Phoenix AZ area. I'm a semi-retired, 75 year old, psychotherapist specializing in women who have been abused and or those who have chronic degenerative diseases e.g. cancer. I'm a Minister and Master Practitioner in each of N.L.P. (Neuro Linguistic Programming) and Ericksonian Hypnosis and practicing since 1979. Therefore, I work with both the psychological and spiritual aspects. Further, I refer where appropriate, to an Alternative Medical Doctor. My fee would be by donation only as most of these women are not in a position to afford much. March 31 is fast approaching -- the early registration deadline for the 15th Annual International Military and Civilian Combat Stress Conference. It will take place this year at the South Mesa Staff Club at Camp Pendleton (Oceanside), California, from Friday, 4 May though Thursday, 10 May. Themes include supporting our war fighters and their families, terrorism, combat stress, Operation Iraqi Freedom issues, and PTSD. For more information and a registration form, please download the PDF brochure, or visit Continuing Education Central. This annual multi-disciplinary event brings the leading mental health professionals and chaplains in the military together to share their clinical expertise dealing with combat stress, the threat of terrorism, PTSD, and Operation Iraqi Freedom (OIF). This combat stress conference is the longest running and one of the best of it’s kind in the world. Throughout the years, this seven-day conference has trained both military and civilian staff to provide services to military personnel suffering from the various combat stress problems as well as civilian disaster victims. The focus, as you can see from the attached brochure, is not only combat stress issues, but also other issues like family support. A recent professional medical journal estimated that 400,000 military personnel would be in need of mental health services by 2008. As you can see—now more than ever—there is a need for this conference to continue to train both civilian and military staff to address this present and continuing need. Some highlights of the 2007 conference include a Special Guest Presentation by Duane “Dewey” R. Clarridge—the former head of the CIA’s Counter-Terrorism Center and the Author of A Spy For All Seasons: My Life In The CIA...plus other invited guests, statesman and stateswomen. And, this year we have added “A Show For Family Support” Variety Show on Saturday Night as well as a Living Military History From Rome to Current Era: How Combat Stress And Family Support Was Addressed. The weekend conference features 18 plenary sessions and during the week you can choose from seven one-day courses and five two-day program. And, if you're a licensed medical or mental health professional, you can earn up to 8 hours of continuing education each day. Worth taking the time to attend if your schedule permits. Democrats newly in charge of Congress called the report the latest evidence of an outdated system unable to handle a coming influx of veterans from Iraq and Afghanistan. Investigators earlier this month found that the VA's system for handling disability claims was strained to its limit. "Who's been minding the store?" said Sen. Patty Murray, D-Wash., a member of the Senate Veterans Affairs Committee. "They keep putting Band-Aids on problems, when what the agency needs is major triage." [I]n White City, Ore., ... officials reported roof leaks throughout the facility, requiring them to "continuously repair the leaks upon occurrence, clean up any mold presence if any exists, spray or remove ceiling tiles." In addition, large colonies of bats resided outside the facility and sometimes flew into the attics and interior parts of the building. "Eradication has been discussed but the uniqueness of the situation (the number of colonies) makes it challenging to accomplish," according to the report, which said the bats were being tested for diseases. "Also, the bats keep the insect pollution to a minimum which is beneficial." •In Oklahoma City, secondhand smoke from an outside smoking shelter sometimes infiltrated the building through the women's restroom. •Deteriorating walls and hallways were common, requiring repair, patch and paint in 30 percent of patient areas in Little Rock, Ark. •Numerous unspecified "environmental conditions" affected the quality of the building in New York's Hudson Valley, with the private landlord repeatedly refusing to fix problems. The VA is taking steps to relocate to another facility. •Roof leaks or mold at facilities such as Hudson Valley; North Chicago, Ill.; Indianapolis; Puget Sound, Wash.; Portland, Ore; and Fayetteville, Ark. Joe Davis, spokesman of Veterans of Foreign Wars, said, "We now expect these problems to be corrected immediately and not shelved due to insufficient funding or because the proper care and treatment of our wounded veterans is no longer in the national spotlight." Nicholson says "immediate corrective action" will be taken. [UPDATE Mar 23 2007]: Download the full report [pdf], courtesy of Larry Scott's VAWatchdog.org.